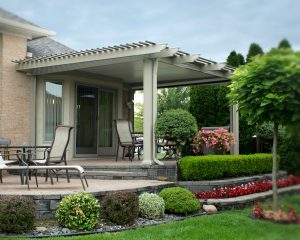 Homeowners in the Mullica Hill, New Jersey, area who are considering adding a patio cover to their home should take a look at the many styles offered by SRA Home Products. We exclusively install patio covers and other outdoor living products manufactured by TEMO, an industry leader. Like all of TEMO’s outdoor living products, their patio covers are constructed from heavy-duty, fully extruded aluminum and feature a remarkable TEMKOR polymer coating. St. Thomas — Our St. Thomas patio covers feature curtain walls that allow for optional retractable screens to be installed. If you’re deciding between an open patio cover and an enclosed screen room, this model offers the best of both worlds. Sunlight pavilion — What sets our sunlight pavilion apart from other patio cover styles is its innovative polycarbonate roof. Available in three standard colors and millions of custom colors, this roof allows natural light to pass through, making it the perfect cover for homeowners who enjoy reading outside while remaining protected from the elements. Santa Fe — Our Santa Fe patio covers are similar to our St. Thomas model, in that they include curtain walls, but they also come with Mediterranean-inspired pergola trim along the perimeter of the roof. In addition to patio covers, SRA Home Products also offers carports. Our carports are ideal for protecting your vehicle from the elements, including harsh precipitation and the sun’s damaging rays. If you’re in the Mullica Hill, NJ, area and you’re interested in adding one of our patio covers to your home, please contact SRA Home Products today. We look forward to working with you on your next project.